Shiva Moslemi is a Registered Organizational Excellence Specialist with OES and a member of the research team participating on the ‘first global assessment on the current state of organizational excellence’ that was launched by the OETC and has been supported by the GBN, ISO/TC 176 and International Academy for Quality. 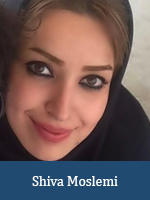 She received a M.Sc degree in Industrial Engineering from Kharazmi University, Iran and earned the Brilliant Talent Student award for both degrees. Her interest research areas are quality control, performance and productivity measurement models, optimization under uncertainty, supply chain management, healthcare management, mathematical modeling and operation research and system analysis. She currently serves on the scientific committee staff for the 12th International Conference on Industrial Engineering 2016. Shiva has published papers about performance evaluation of healthcare and works at Kharazmi University.